Salvia clevelandii Winnifred Gilman is noted for the dark blue flowers and rich red calyx. The gray foliage is wonderfully fragrant. Salvia Winnifred Gilman is a selection from Salvia clevelandii. 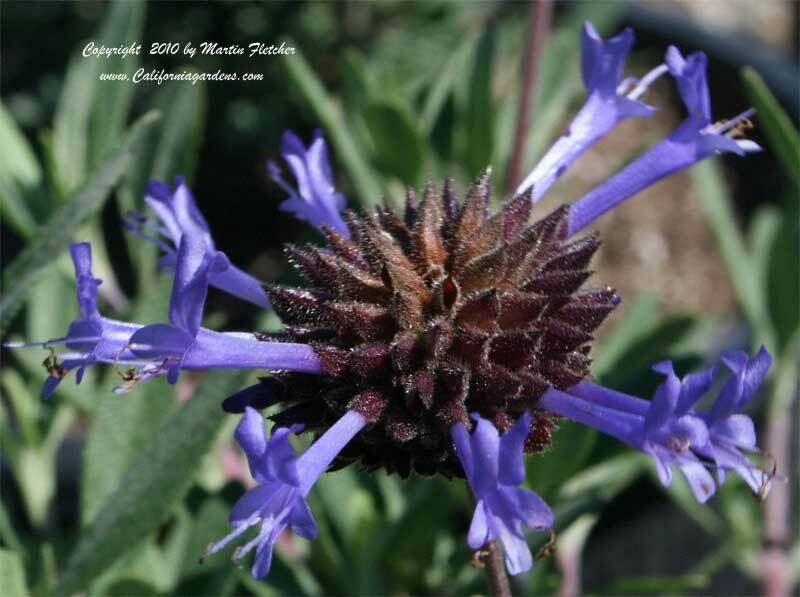 The Blue Sage typically grows to 4 feet tall and wide. Salvia clevelandii is native to the Southern Coast Ranges of California and Baja California. Salvia Winnifred Gilman is quite drought tolerant and requires reasonable drainage and breaks between irrigation cycles. Salvia clevelandii Winnifred Gilman is a great nectar source for the Painted Lady, Mournful Duskywing, California Dogface Butterfly, Cloudless Sulfur and the Northern White Skipper, and is a nice addition to the Butterfly Garden. The Blue Sage will survive Winter temperatures into the low 20°s. High resolution photos of Salvia Clevelandii Winnifred Gilman are part of our garden image collection.